Items are presented in reverse chronological order - the latest news is at the top. 4 October 2012: WebOS Ports has made available their early work on porting Open webOS to the Galaxy Nexus. It's not ready to be your daily driver smartphone yet, but it's operational, and that's a start. 1 October 2012: First the Galaxy Nexus smartphone, now the Transformer Prime tablet. Open webOS, everywhere. 28 September 2012: Just hours after the release of the 1.0 version of Open webOS OpenEmbedded, the WebOS Ports team has uploaded a video of Open webOS running on a Samsung Galaxy Nexus. It's not exactly pretty, and it's not in any manner fast (we're told there's no hardware acceleration happening in the port's current state - i.e. this was a 'quick and dirty' proof of concept), but it still brings a tear to our eyes. 28 September 2012: Following the roadmap laid out back in January, HP has delivered Open webOS 1.0 to the masses as planned. The prior month saw the release of two betas, one for desktop Linux and the other for assorted devices thanks to OpenEmbedded integration, and now we're seeing the finalized versions of each. The important thing about the 1.0 release for Open webOS is that it's now a complete operating system and something that can be ported to other devices. While HP intends to leave that work to third party device manufacturers and the community, they did put together a video to demonstrate how Open webOS works on a desktop, using a wide-screen HP TouchSmart PC to run a full-screen version of the operating system. 27 September 2012: Hosanna! The wave launcher returns! And what's this? A text cursor virtual trackball to improve the TouchPad's otherwise pitiful hunt-and-peck cursor placement? Oh my stars. "Was what happened with webOS a year ago one of the most colossally rash, irresponsible, and gallingly asinine business decisions we've seen in the past several years in tech? Without a doubt. But is it worthy of hate a year later? I don't think so. I didn't think so then." 31 August 2012: Two versions of Open webOS were released to beta - the Linux Ubuntu OS-in-an-app, and one that implements OpenEmbedded to enable installation on a multitude of devices. That said, Open webOS 'OE' out of the box isn't installable on anything - it needs drivers, tweaking, and a bit of elbow grease - and it lacks something rather important: a user interface. But it's a beta. 31 August 2012: The first release of Open webOS is a version that boots as an app inside Linux Ubuntu. What's the use of that? It's for developers; they can do the majority of their coding and testing all on one machine. 16 August 2012: The first leaves sprout from the fruit of webOS Community Edition with the release of the improved LunaSysMgr homebrew component LunaCE. While just an Alpha, LunaCE adds significant functionality to the multitasking card user interface on the TouchPad. 14 August 2012: HP is spinning off the webOS Global Business Unit as a quasi-independent company called 'Gram'. The new Gram will "leverage the core strengths of webOS, Enyo, and [their] cloud offerings", but to do what isn't yet clear. "At HP we don't just believe in the power of technology, we believe in the power of people when technology works for you. To do the things that matter. To dream. To learn. To create. To work. If you're going to do something, make it matter." 5 August 2012: webOS Nation chats with WebOS Ports chief Tom King, who explains how his organization works, what they're doing with the webOS Community Edition, and the support they've been getting from HP along the way. "While time is obviously a restraining factor in all things, the straw that broke the update camel's back was the choice to use the Linux Standard Kernel 3.3. While it's technically possible to make a build of Open webOS that will run on the TouchPad, when push came to shove, making that happen was dropped off of the list of top priorities in Sunnyvale." 3 August 2012: How far the open source cross-platform application framework Enyo 2.0 has come, how far it has to go, and how it's going to get there. "For Open webOS we are aiming for support on future hardware platforms where SoC’s support Linux 3.3+ kernel and where open source replacements for proprietary components are integrated. Existing devices cannot be supported because of those many proprietary components, including graphics, networking and lack of drivers for a modern kernel." 31 July 2012: LunaSysMgr is the system manager for webOS, responsible for the launcher, card view, menus, running WebKit, and rendering Enyo applications. In other words, it's kind of a big deal for webOS. 24 July 2012: HP and Microsoft signed a contract to protect the intellectual proprerty of ARM processor-friendly Windows RT, and that was fine because the webOS unit had their own hardware engineers. They don't anymore, and that makes things a little more difficult for HP. 17 July 2012: Pinch and drag card stack management? Oh yes, it is real. "As a sign of how serious HP is about the community aspect of the webOS Community Edition, they actually worked hand-in-hand with the WebOS Internals homebrew group to make this happen. WebOS Internals has put together a team named WebOS Ports dedicated to working with the Community Edition, led by Tom King." 29 March 2012: Need to communicate between your desktop and webOS device? Novacom is here to help. 19 March 2012: The inclusion of Android driver support in the kernel means that software using it will be more easily installed and operated on a wide range of hardware - including Android smartphones and tablets. Of course, you wouldn't just be able to throw raw webOS with the Linux Standard Kernel onto a Droid RAZR and expect it to work right without a hitch. Open webOS branding design competition update: a super sweet prize awaits! 6 March 2012: Open webOS needs a logo. Can you be the one to make it? 29 February 2012: The first batch of user interface bits for the Enyo 2.0 platform were made available, along with Beta 2 of the framework, which takes Enyo truly cross platform, supporting multiple web-app operating systems and all browsers. 28 February 2012: 275 of the 500 remaining HP employees working on webOS got notice on Tuesday that their services would no longer be required going forward with Open webOS. The cuts to software engineers hit multiple divisions across the webOS group. 15 February 2012: Open source homebrew development group WebOS Internals has the cooperation of HP to implement the just-released QtWebKit framework and Isis browser onto currently-available webOS devices like the TouchPad tablet. Timeframe, weeks. "All drivers of Android will be included in Linux kernel 3.3 the LSK. Isn't that interesting?" What is this Open webOS 1.0? 25 January 2012: Sometimes things don't work out the way you intended. That's the case with webOS, time and time again. With open source webOS is pivoting once more and revising the dream of what it is to be webOS. 25 January 2012: As part of the new enyojs.com website, HP's posted a few demos of Enyo working in the browser, and it's fascinating stuff to see what we've used on webOS tablets translated to a web browser. 25 January 2012: One of the advantages of an open soure application framework is already seeing the light of day: expansion to new platforms. webOS developers wasted no time in porting their apps to other platforms, including Android and the web. 25 January 2012: In addition to a roadmap, HP has fully open sourced the Enyo 1.0 application framework and announced the Enyo 2.0 framework. Both will allow developers to use Enyo to build apps using Enyo that can be made to run on other platforms such as iOS and Android as well as in all major desktop web browsers. 25 January 2012: The open source webOS project gets a timeframe (fully open source by September 2012), a new kernel (Linux standard), and much more. 17 January 2012: HP's got a new Chief Strategy Officer, and his name is Bill Veghte. He comes from within HP and will still retain his EVP of Software position. As part of the CSO role, he'll be leading HP's Cloud and webOS open source initiatives. 13 December 2011: Now that HP has decided (for now) to keep webOS alive while converting it to an open source operating system, we thought it might be helpful to help explain what open source software is (and isn’t) and how being open source might impact on webOS’ future. 10 December 2011: The operating system as it stands today contains a number of parts that have been licensed from other parties, and HP can't go and distribute somebody else's work into the open source realm. What HP has to do is "scrub" webOS, to go through it and pick out all of the proprietary bits that they don't own and replace them with already available open source code, create their own code and distribute it as open source, or - if not vital to the operation of webOS - distribute the open source project without it. 9 December 2011: You’re open sourcing webOS with the intention of maybe eventually making new hardware, and in the meantime hoping that somebody puts it onto other devices? So with Android already available, widely-adopted, and a light-year or two ahead of webOS, what manufacturer in their right mind would pick webOS? 9 December 2011: We find ourselves at the middle road between a rocketship into space with new devices or a coffin made of TouchPads. It’s a road, and it’s heading into the desert, and frankly we don’t know where it goes or how far we have to go to get there or if we have enough gas to make it. 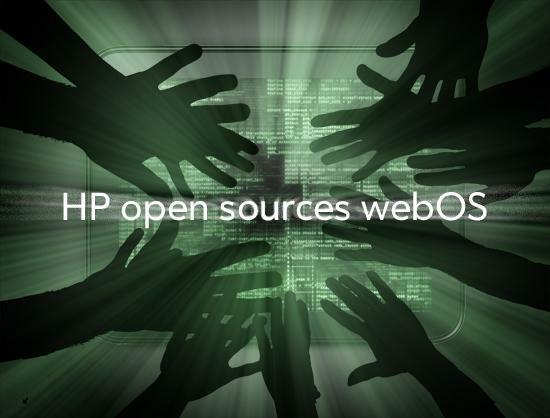 9 December 2011: HP plans to open up webOS to open source, all the way down to the Linux core. Also to be made open source will be the Enyo application framework. The release will happen in stages, but eventually it'll all be out. 9 December 2011: HP is contributing webOS and the Enyo framework fully to the open source community. The intention of the move is to "accelerate the open development of the webOS platform" with HP helping to lead the charge with significant code and monetary infusions. The announcement of webOS going open source brings to an end months of speculation about what HP would do with the operating system.